Add the pasta and 1 tbsp salt to a large pan of boiling water. Start to cook for 12 minutes until al dente. 5 minutes after boiling the pasta, heat the oil and garlic in the frying pan over a low heat for about 2,3 minutes. Stir into celery and giner. 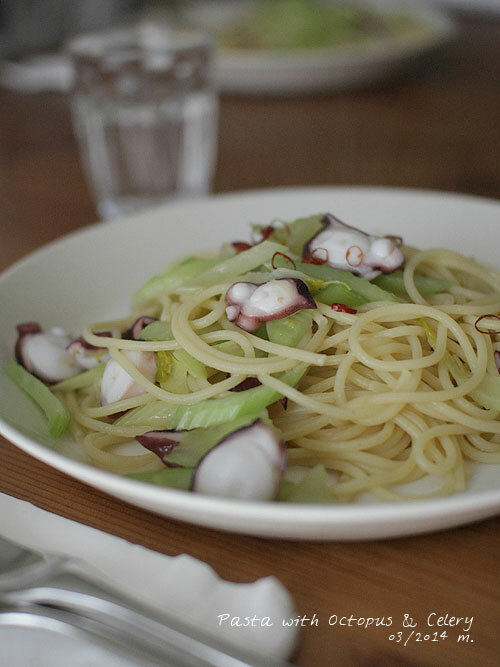 Add the octopus and season with kelp powder and salt and pepper. Drain the pasta and stir into the frying pan. Season adjust with salt and pepper. Serve immediately.